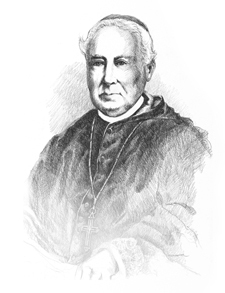 Bishop William G. O’Hara, the first Bishop of Scranton. In establishing St. Thomas College, Bishop O’Hara sought to provide a place where young men could enrich the business and professional life of Scranton and the surrounding area. He also envisaged the College as a place that would foster vocations – a vision that has been fulfilled for well over 100 years. The College’s first graduating class consisted of 62 men, including 12 seminarians. Today, it is estimated that at least half of the active priests of the Diocese of Scranton are alumni of The University of Scranton. Old Main Street, now known as Wyoming Avenue, the original location of St. Thomas College. From 1888 to 1896, priests and seminarians staffed the college, located on Wyoming Avenue. While it was not until 1942 that the Jesuits were invited to administer The University of Scranton, Rev. Daniel MacGoldrick was named President of the College in 1895. Fr. MacGoldrick, a member of the Maryland– New York Province of the Society of Jesus, served as President until 1897, when the Christian Brothers arrived to administer the College for the Diocese. St. Thomas College was renamed The University of Scranton in 1938 and was relocated from Wyoming Avenue to its current location in 1940 when Worthington Scranton donated his estate to the Diocese. Two years later, at the invitation of Bishop William Hafey, 18 Jesuits, led by Rev. Coleman Nevils, S.J., the newly appointed president, arrived on campus to administer the University. This late summer day of 1942 marked the convergence of Catholic and Jesuit education at Scranton. The Jesuits restructured and strengthened Scranton’s traditional and pre-professional programs with an emphasis on the liberal arts, which are the foundation for every program at a Jesuit university. The University has flourished under the Jesuits, growing from a primarily commuter school with fewer than 1,000 students to a broadly regional, comprehensive university with a total enrollment of more than 5,000 students in undergraduate, graduate and non-traditional programs. The academic quality, distinctive experience and value of a Scranton education consistently garner national recognition.